The former Bridget Foy's restaurant on Second and South streets. The restaurant's annual Halloween party will go on Saturday as a fundraiser for the restaurant's staff. A popular South Street restaurant is set to celebrate its annual Halloween party this weekend as planned. It'll just take place under different circumstances. 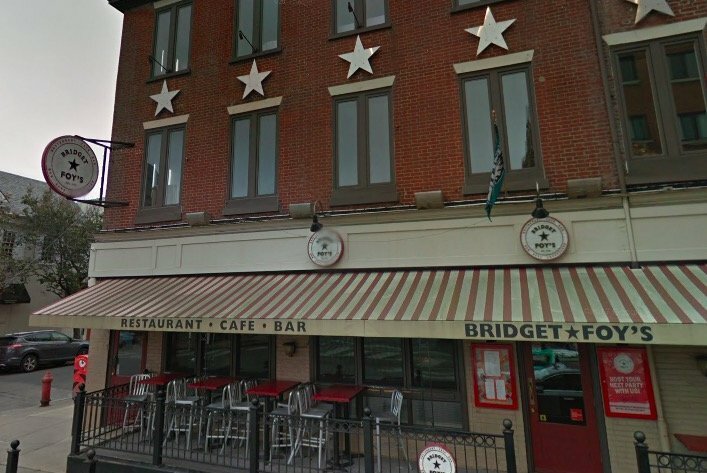 Organizers plan to raise money for staff members at Bridget Foy's after a fire destroyed the popular establishment on Wednesday morning. The flames also injured multiple firefighters, killed two rescue dogs housed next door in a pet shop and displaced a number of apartment residents upstairs. The fundraiser takes place 7-10 p.m. Saturday in Head House Square on Second and Pine streets. Attendees can expect a retro music mix, beer donated from Philadelphia Brewing Company, food and a 50/50 raffle. "The outpouring of love and support has been overwhelming and with that, it was decided to keep this Saturday's annual Bridget Foy's Halloween party on the calendar and use it to support each other, celebrate the decades of memories and friendships and most importantly, raise money for the wonderful Bridget Foy's staff!" the restaurant said on Facebook. Organizers are asking for at least a $5 donation at the door. Crews tore down what was left of the restaurant after the blaze, 6ABC reported. The restaurant, which was closed for the night when the fire broke out, opened in 1978 amid the Headhouse District restaurant boom. The Red Cross is reportedly assisting those affected by the fire.